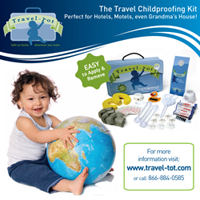 Travel-Tot: Boutique of the Week: Magic Beans! With four locations in the greater Boston area, Magic Beans is the brainchild of husband and wife team Eli and Sheri Gurock. The Gurocks visualized a retail experience "designed for kids and optimized for parents... that would balance the fresh and new with the tried and true." And so in 2004, they founded Magic Beans, a unique boutique offering everything from baby gear and modern nursery furniture to a handpicked selection of toys for all ages! The Gurocks understand that their customers represent a broad spectrum of parenting philosophies, and tailor their product selection accordingly. They actively seek out toys that inspire creative interactions and imagination. They also put a great deal of thought into their selection of baby gear and nursery furniture, relying on their own experience and the feedback of other parents to determine what products will best meet the needs of their clientele. But Magic Beans is more than just a retail store - it's a community touchstone! Each Magic Beans location boasts a "Playscape" where their youngest customers can relax and sample the store's wares, and many of the stores offer unique in-store events ranging from storytime to crafts activities to Stroller Speed Dating! Eli and Sheri are proud of their extensive knowledge of the products they carry; from strollers and car seats, to toys and travel gear. They carry items from a wide variety of companies and endeavor to help their customers make decisions that will best suit their individual needs. They believe that customer service is of paramount importance and welcome feedback on customer experience at Magic Beans, as well as ideas for how they can do even better! Indeed, they are so committed to customer service that they offer personal attention via e-mail regarding consumer's experience and feedback. So, if you find yourself in the greater Boston area, check out Magic Beans at one of their four fabulous locations: Brookline, Cambridge, Hingham, and Wellesley! You'll instantly understand why they have garnered so much praise and a reputation for excellence!